The president isn't entirely ruling out yet another shutdown. President Trump and his top aides aren't ruling out the possibility of yet another government shutdown in less than three weeks, even as the president floats the possibility of declaring a national emergency if no border wall funding deal is reached. As federal workers and the economy begin to rebound from the longest government shutdown in history, White House press secretary Sarah Sanders left open the possibility Monday that the same thing might happen again in mid-February when another budget deadline arrives. "The president doesn't want to go through another shutdown," Sanders said in the first formal press briefing of 2019, when asked if the president is willing to undergo yet another shutdown. "Ideally Democrats would take the next three weeks to negotiate in good faith, as they've indicated that they would, and come up with a deal that makes sense." Asked what her message is to federal employees — such as whether they should be saving up their money for yet another time period without paychecks — Sanders said those employees should call their Democratic members of Congress. "My advice would be to call your Democrat member of Congress and ask them to fix the problem so we don't have to continue having this process," Sanders told reporters. The Congressional Budget Office estimated Monday that the 35-day shutdown cost the economy about $8 billion, $3 billion of which will likely never be recovered. Top White House economic adviser Larry Kudlow, asked in the same briefing if he'll advise Mr. Trump to avoid a second shutdown, didn't commit. "There is a process. We'll see if it works. It's not my place to say that," he responded in Tuesday's press briefing. Kudlow also said he disagrees with the CBO's numbers on the shutdown's economic impact. The president himself — who has said he might pursue a national emergency instead if he can't get his border wall funding — also isn't entirely ruling out yet another shutdown. "I wish people would read or listen to my words on the Border Wall. This was in no way a concession," the president tweeted Friday, after critics and allies alike suggested he had caved on his pledge not to reopen the government without border wall funding. "It was taking care of millions of people who were getting badly hurt by the Shutdown with the understanding that in 21 days, if no deal is done, it's off to the races!" 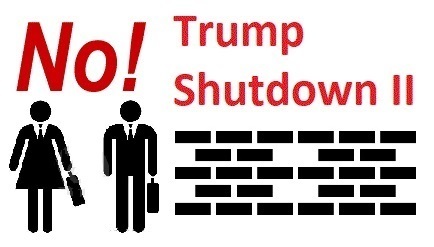 But some Republicans are cautioning the president against a second shutdown, particularly after one that failed to net any of the objectives the president desired, and both the president and Republicans took the brunt of the blame for it in public opinion polls. Senate Majority Leader Mitch McConnell told reporters Monday a shutdown is a "bad idea," and "remains a bad idea." Sen. Lindsey Graham urged the president on Twitter to simply declare a national emergency. "If White House and Congress fail to reach a deal then President @realDonaldTrump must act through emergency powers to build wall/barrier," Graham wrote.